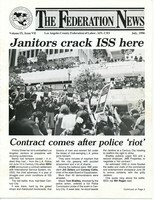 Newsletter of the Los Angeles County Federation of Labor descrbing the win of the JFJ Campaing in Centry City after facing much police brutality. Local 399 staff labeled this photograph of religious leaders and AFL-CIO leader Lane Kirkland "Bishops." 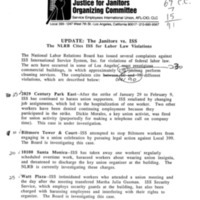 It illustrates the early appeal to supporters beyond the labor movement proper to support the cause of the janitors union.